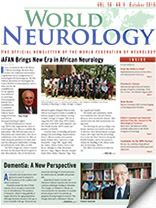 It was a momentous day in the history of African neurology. For more than 40 years, the continental neuroscience organization was an amalgamation of neurologists and neurosurgeons. The Pan African Association of Neurological Sciences (PAANS) served its purpose, and it’s time now for the establishment of an organization dedicated to neurology. Neurosurgeons already have established the Continental Association of African Neurosurgical Societies and held an inaugural meeting in Algiers. The World Federation of Neurology (WFN) fully supported the views of neurologists across Africa to establish this association. This followed many years of discussions and consideration, since the establishment of the Task Force for Africa in 2006 during the presidency of Johan Aarli and the subsequent stakeholders’ meeting in Stellenbosch, South Africa, in 2008. Representatives from 27 countries participate in the inaugural meeting of the African Academy of Neurology in Dakar, Senegal, in August. The WFN designated a third of its profits from the Marrakesh World Congress to the Africa initiative. Part of this fund was released to gather delegates from as many African neurological societies as possible to hold an inaugural extraordinary meeting in Dakar, Senegal, in August. This was arranged by Prof. Gallo Diop, WFN trustee and chair of the WFN Africa initiative, and Prof. Riadh Gouider, WFN trustee and president of PAANS. I had the honor of attending and participating in the proceedings. Representatives from 27 African societies were present: Benin, Burkina Faso, Cameroon, Congo Brazzaville, Congo DRC, Egypt, Ethiopia, Gabon, Ghana, Guinea, Ivory Coast, Kenya, Madagascar, Mali, Mauritania, Morocco, Niger, Nigeria, Rwanda, Senegal, South Africa, Sudan, Tanzania, Togo, Tunisia, Uganda and Zambia. The bylaws and constitution, which were drafted by Prof. Mostafa Elaloui, Morocco, were circulated in advance. After careful review, the draft unanimously was approved. The following day and according to the bylaws, elections were held for the board of directors. Prof. Michel Dumas, Limoges France, and I supervised the proceedings. It is of note that Prof. Dumas is among the PAANS founders, and he was present to witness the founding of the African Academy of Neurology (AFAN). The AFAN council of delegates approved the establishment of a permanent secretariat in South Africa, with all the necessary legal implications and registration as a non-profit organization. Lawrence Tucker, AFAN treasurer, will undertake the task. With the formation of AFAN, the sixth chain of the WFN regional organizations is now complete. I am sure that all of us wish our African colleagues all the best in their tireless work to promote and deliver neurological care in Africa.